Sophomore Ryan Duchemin goes in for the kill on Saturday, Jan. 26, against Rutgers- Newark. Vassar won in straight sets, with Duchemin leading the team with seven blocks. Courtesy of Joe Clifford. Students are back on Vassar’s campus and volleyball is back in Kenyon Hall. The men’s volleyball team played their first home games of the season this weekend, winning against Rutgers-Newark in straight sets and against Emmanuel College by three sets to one. After dropping their season opener, the Brewers have now won three straight matches. However, considering the run of success the team has enjoyed over the last few years, this winning start won’t surprise volleyball followers. The 2018 iteration of the men’s team reached the NCAA tournament and won the quarterfinal against the number-four ranked Kean University, but ultimately fell short against number-one ranked Springfield College in the semis. If you had to point to a reason for the 2018 team’s success, you would look no further than superstar Matthew Knigge. Knigge finished his senior season second in the nation in both blocks and kills per set, easily leading the Vassar team in those key statistics. He was also second on the team in aces. (He tacked on his 1,000th career kill last season as well.) By every measure, Knigge was a force with which to be reckoned, and belongs in the conversation for best athletes in Vassar College history. However, Knigge has now graduated, and is pursuing a professional career in Germany. So how will the loss of such a talented player impact the success of the team? Ros, who was second in the team in kills behind Knigge last season, shared a similar sentiment: “We’ve been able to spread the offense out which has given the opportunity for more players to contribute. I think that as the season progresses, the gap will be made up by a little bit of everyone.” Getting significant contributions from new faces will also be key for Vassar this year, as the team’s usual starting lineup includes three first-years. Head Coach Richard Gary’s squad will be hoping that with this new balance opponents will find it more difficult to game plan against Vassar, improving the Brewers’ offense. With their strong start, the team could be on its way to making it back to the NCAA championships, with the national championship, of course, being their ultimate goal. Both Ros and Duchemin stressed the mental effort the team puts forth towards accomplishing its goals, pushed by Gary. “Coach has us meditate and visualize to stay calm and focus,” Duchemin said. During the preseason, the Brewers worked to make sure they will be ready when the time comes for them to take another shot at a deep postseason run. Ros reflected, “Our main goal is to win a national championship. During the preseason, we spent time scouting ourselves, addressing weaknesses and visualizing playing at the final site.” With the turnover of talent, it remains to be seen if there will be some growing pains, or if the team will once again play to the high and consistent level that spurred the program’s rise to the top of the DIII ranks last season. If the men’s volleyball team is able to execute its gameplan, it may well be on its way to another deep foray toward the national championship. Having already visualized the moment, the team appears both mentally and physically prepared to mount its run back to the NCAA tournament and make an impact when it gets there. That is the standard the program has set for itself. Vassar will play against New York University in Springfield, MA, this Friday, Feb. 1, but the toughest challenge will be when they take on defending national champion Springfield College the next day. The next home game for the Brewers is next Wednesday, Feb. 6. 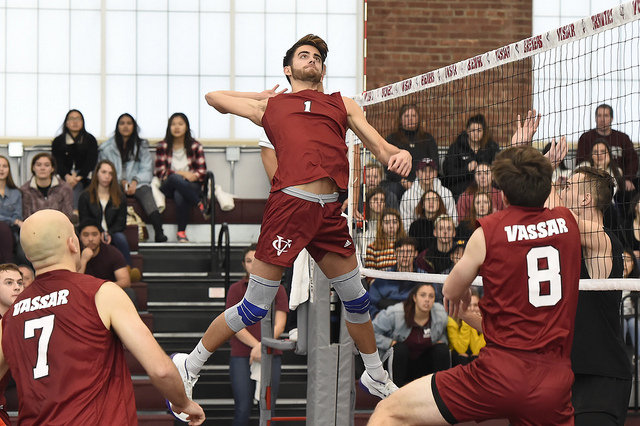 As Vassar men’s volleyball sets out on another long season, although the roster is filled with new faces, the objective remains the same.